Plot: Commander Artorius Castus and his brave Sarmatian (sic!) knights are sent out on a last, suicide mission to rescue a Roman family stranded by the incoming Saxon invasion north of the Hadrian Wall. Pros: We liked the concept of Guinevere the Fearless Pict Fighter, even if we didn’t appreciate miss Knightley rendering of it. Cons: Operatic costumes (need we say leather bra-hosen worn by Guinevere in the battle scene?). 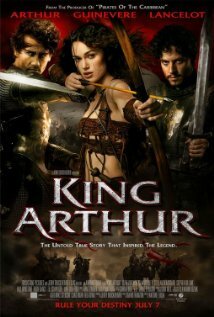 Plot which wipes out most of the Arthurian characters before they had a chance to become heroes of their own stories. Overall schmaltziness.